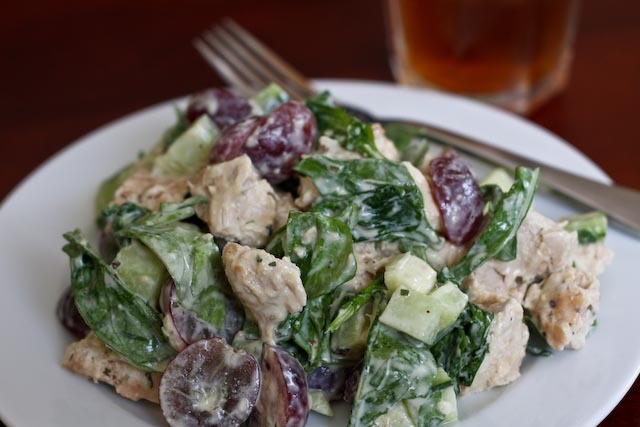 Chicken salad gets a healthy upgrade with arugula, grapes, cucumber, and a healthy Greek yogurt dressing. Nope, no mayo in sight. 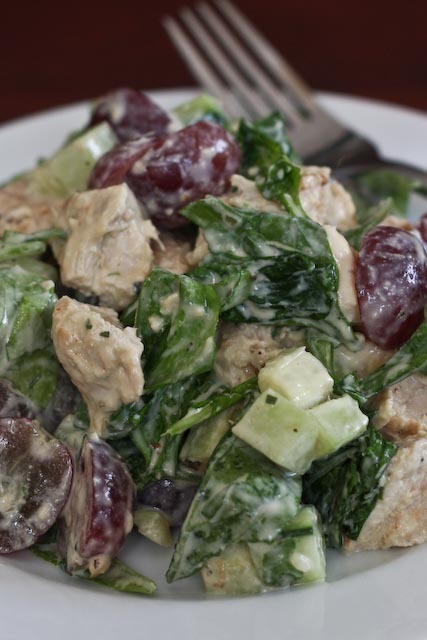 Don’t worry though, this salad packs so much flavor, you won’t even miss it. 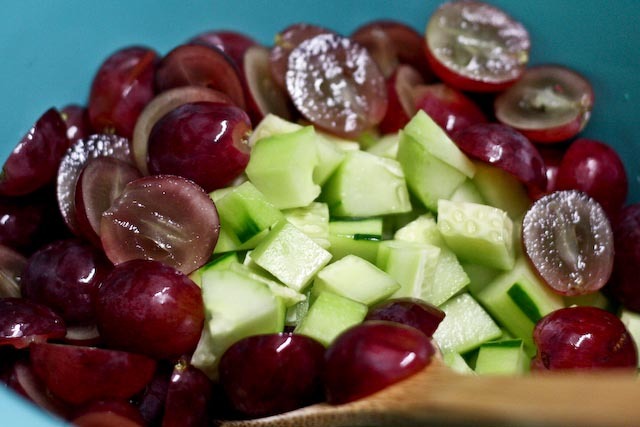 I prefer to use red grapes in a salad like this, but green grapes would work just fine. Special sauce. 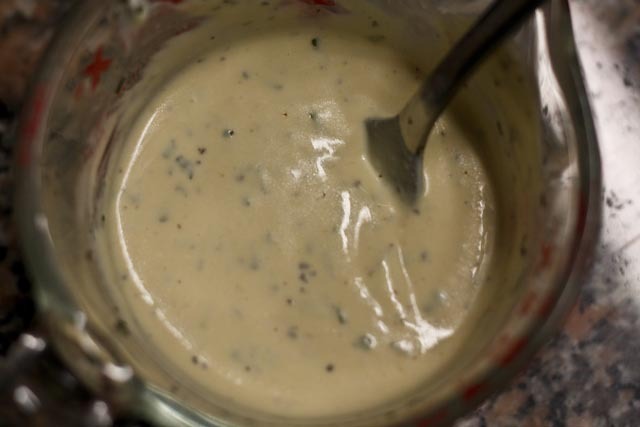 Greek yogurt, lemon juice, vinegar, and a few spices are all you need to whip up this awesome dressing, which is much better for you that it’s mayo-based cousin. (Your heart with thank you later). Pre-cook the chicken any way you like. I used my Greek yogurt and lemon marinade for the chicken, and it paired wonderfully with the salad. I highly recommend trying it, but regular grilled or baked chicken would taste great too. 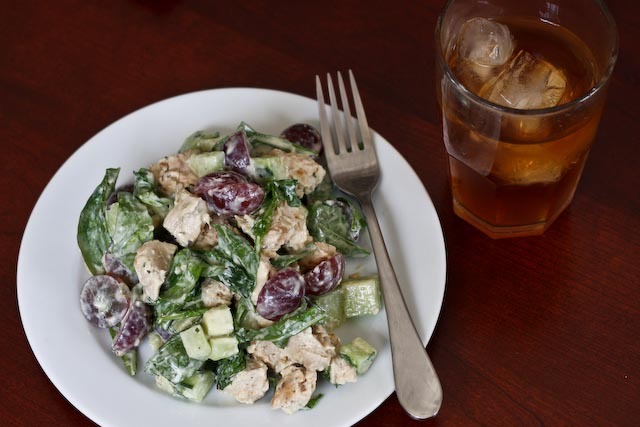 Nothing beats a good chicken salad and a cold glass of fresh iced tea on a hot summer day. 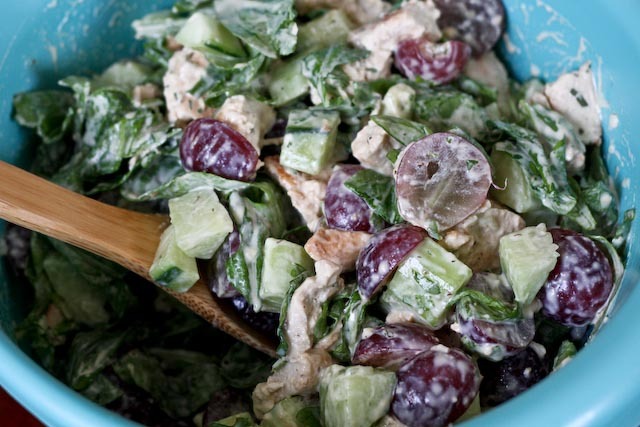 I think this salad is great for sandwiches, brunch, lunch, as a side dish, or just by itself. Hope you like it as much as I do! 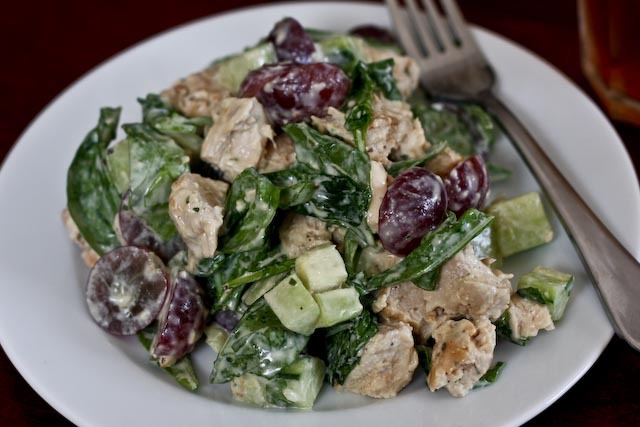 In a large bowl, combine chicken, cucumber, grapes, and arugula. In a small bowl, whisk together Greek yogurt, olive oil, lemon juice, vinegar, mustard, tarragon, marjoram, salt and pepper until well combined. Pour over salad and toss to combine. Serve chilled. *Fresh tarragon would be an excellent substitute, if you can find it. Chicken salad, mayo free 🙂 Sounds like something that would have been a huge hit at 2903!! Hope that all is going well! R and I are contemplating vacation choices for the spring- no dates yet, but I think we’ve narrowed it down to visiting you guys or going to see my brother in Hawaii! I’ll send you an email when we get a little more of our thinking/planning done! !